This is a great little sauce to serve with cod, or any other fish. 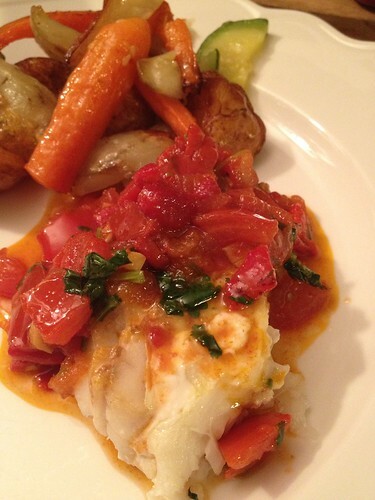 We had it with oven-cooked cod (15 minutes, 200 degrees) and roasted veggies, and it was really flavorful. Not bad for 20 minutes! Start by gently frying the garlic in the olive oil for five minutes on medium heat. Meanwhile, dice the de-seeded tomatoes and the peppers. Add those to the pot, and season with Pimentón, cumin, salt and sugar. Cook for 10-15 minutes on low heat. Just before serving, add the lemon and check to see if you want more seasonings. Stir in the coriander, and you're done.